I made kale chips yesterday. Yes, I am aware that is crazy talk in my world, but after our huge chickpea success I was feeling overconfident. 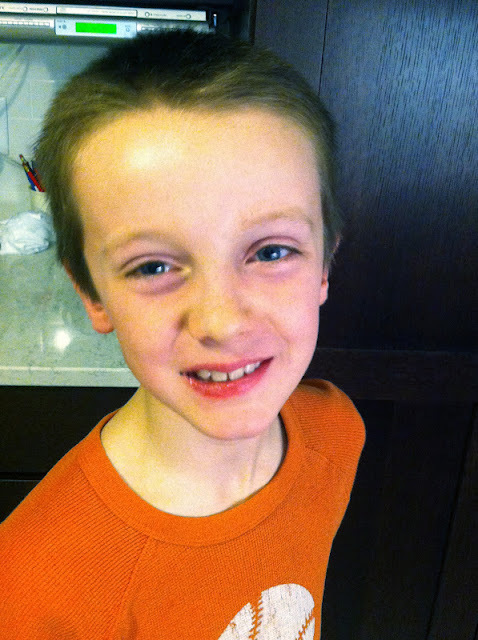 Jack (my all-time pickiest eater) has been so much more open to trying new foods lately. He doesn't always like them, but he's at least been trying them with an open mind (huge progress by the way), so I've been trying to introduce some new things when I can. 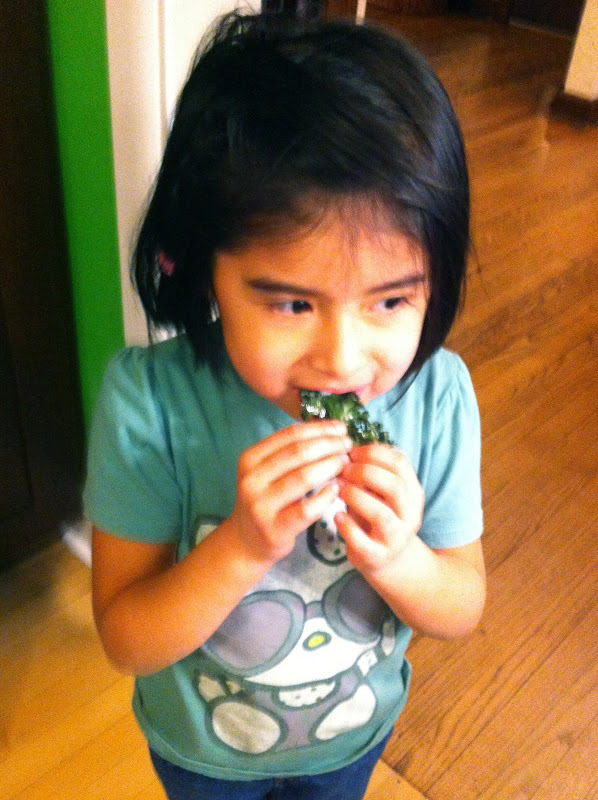 I've read a bunch of blogs from kale chip lovers, but when Michelle said her two veggie haters loved them, I was sold. Off to the store we went. 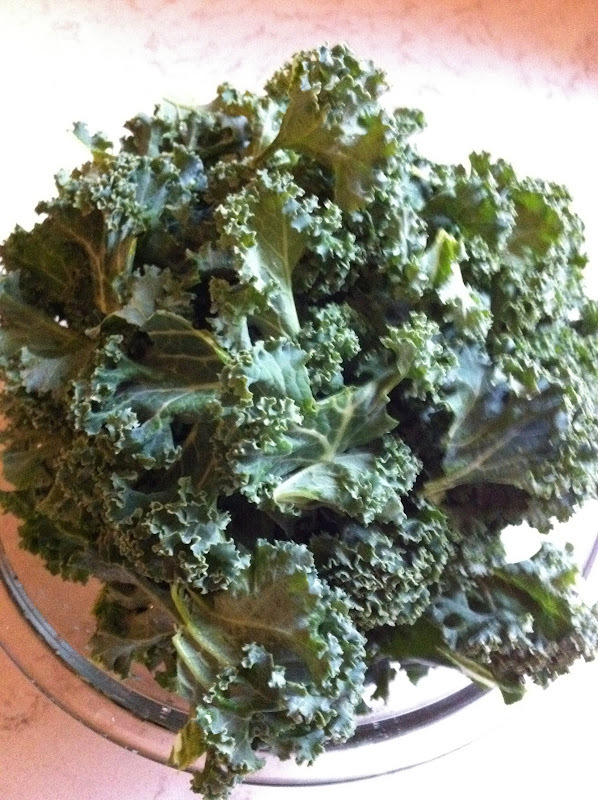 The heaping bowl of kale shown above cost just $1...not bad, right? I followed this recipe from Pip & Ebby and it was super easy...olive oil, baking pan, salt, done! I'm going to show their after pic too (because it's so pretty & mine was not). EJ took the first taste and fell in love. As my most adventurous eater, I am not surprised. She had more with dinner and she is taking a bunch of them to school tomorrow to share with her friends. 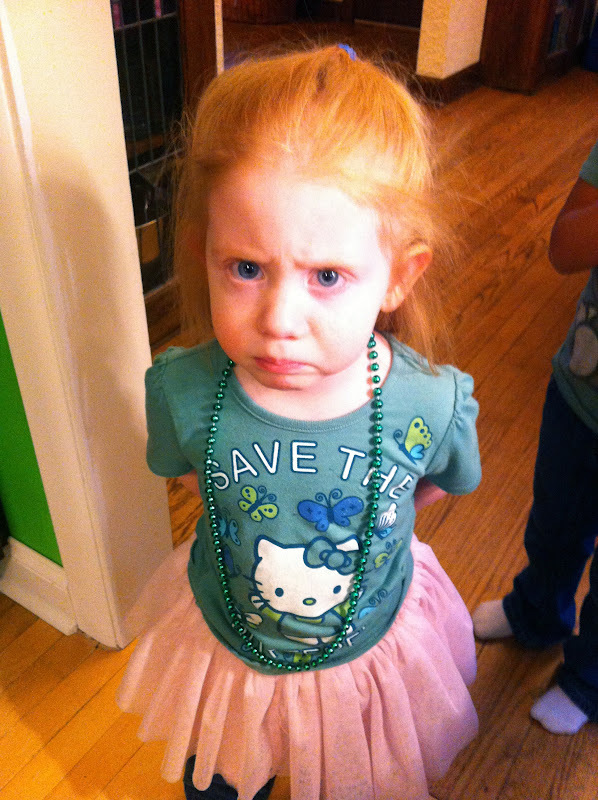 And this is the face I got when I asked my little diva if she'd like to try one. It was green and crunchy and she didn't want any part of it. Matt & I both liked them. Matt echoed Jack's "healthy" comment. I like the salt too much and therefore am sending them to school with EJ so I don't continue to eat them all day tomorrow. I'd say this recipe will be made again, but not as often as we'll make the chickpeas. I appreciate you wanting to be healthier & get the kids to try new (& healthy) things but you're freaking me out!!! Just kidding (kinda). Happy to see EJ loves everything and I cracked up when I read that Jack likes them but can tell they're healthy (I totally get that!) And that face on Olivia? Priceless!!! I think you perfectly captured all 3 kids personalities in one food experiment. I'm actually surprised Jack tried it, that's a big step for him! I hear you Cyndi! Don't worry, I'm still well-preserved! Words cannot explain how hard it is to meal plan with the restrictive eaters in this house, so I'm truly trying to get them to branch out just a bit. Actually, Jack knowingly ate onions last night too. That was HUGE! ha ha ha ha ha! I LOVE her face!!! And Jack's too...so tentative. They're healthy. So eat them up!! I love them. They def satisfy my salt craving. I'll also hit them up w/ pepper so I don't salt so much. Try using lacinato kale next time and see if you can tell a difference. I prefer it w/ that kind of kale. I just about fell off my chair when I realized that this title was from YOUR blog!! I could eat Kale chips every day from now til Christmas and be happy! I like to put nutritional yeast on mine too or a little fresh grated parmesan cheese...trying not to over salt...um, I encourage you to eat those!!! Oh-my-gosh!! Love "little diva's" reaction!!!! So cute and it really did make me chuckle! Hee, the reaction shots of the kids are awesome! I may have to try this "kale chips" thing---leafy greens are like, the one vegetable I'm not in love with yet, so maybe giving them a crispy-baked texture will help? I'm kind of determined to Love All the Veggies, at this point, LOL. Ahh this made me laugh, we have Kale chips and my kids love them... mostly if they are really salty and seasoned with some flavourings (which probably defeats the purpose), but my son, much like your daughter hates to try anything new and I see that face a lot!!! !